Although gleaning some of its initial inspiration from a 2005 book, ‘The Long Emergency’ by Howard Kunstler, this collaboration feels less like a soundtrack than a concept album. Kunstler is mapping out a future where oil production has peaked, economies are increasingly unstable, water scarcity is prevalent, transportation in large part is unsustainable and a return to a more regionalised self sufficiency seems inevitable (all cheery stuff). ‘Music For The Long Emergency’ is a little more optimistic despite its partial development coming in the wake of Trump’s election win. The bringing together of two very creative forces in the funkily infused electro pop of Polica and the chamber orchestra collective of Stargaze fires up a melting pot masterfully stirred by producer Ryan Olsen and conductor Andre De Ridder. Having met in the states, the bands then had a more formal introduction and chance to flesh out some ideas in Berlin where both Polica and Stargaze were keen to work on a project to develop what they had started. With Olsen having come up with some ‘song sketches’ and recorded the initial sessions, he then began work on putting together the threads of each idea. “They were not even song structures, just electronic textures,” de Ridder says. This album, however, is not all politeness and style. ‘Cursed’ is a far more experimental piece with vocoder vocals set against Drum ‘N Bass beats in a Chemical Brothers/Prodigy homage where despairing voices are fused with restless strings. The shortest track on the album, ‘Marrow’, throws up more desperate soundscapes on arguably the most Polica biased track of the seven. Channy’s vocal is full of anguish as she sings over the electro beats and bleeps but still with a stirring array of strings to underpin the whole arrangement. The title track of the album is a fusion of all of the elements in its most cohesive form. The orchestral strings and deep bass piano lead out the track into Channy’s beautiful vocal. The track rises and falls through majestic movements of sound where the instrumentation and vocals are deftly married to create a song that sweeps and soars until the introduction of great bursts of semi-industrial synth notes. The contrasts break down into the latter part of the song where a string and vocal harmony align to restore parity and peace. Where MFTLE hits its sweet spot is on ‘How Is This Happening’, a track partly written in the days following the election of Donald Trump to the US Presidency. The song starts with the air of London Grammar but switches tack halfway through. The heavily repeated vocal gives way to a more dystopian feel where there is a menace in the strings and a undercurrent of unrest. This track feels more like the backdrop to a performance art piece or a modern ballet/dance score. There’s a nod to Dead Can Dance or even Laurie Anderson that looms large throughout this triumph of a track. 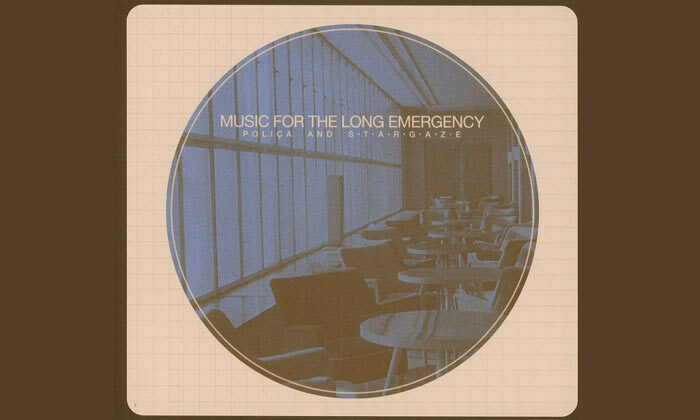 ‘Music For The Long Emergency’ has within it some great pieces of music. It doesn’t, however, come together that well as an album (you could argue that the age of the album is passing making that concern an irrelevance). There seems to be three threads that have been brought together but a little loosely or clumsily. It feels as if there was more that could have come of this collaboration and possibly more will, not just as seems plausible, that they’ve taken the best seven tracks. It’s very good music and there are very good tracks but it has its flaws not least of which is that the more electro-funky elements of Polica have been lost or subdued in favour of the Stargaze collective which is a bit of a shame.